Not many adventure novels are the center of a town’s attention for a whole day. But on Saturday, March 6th, Gloucester will host its first annual Captains Courageous Festival, honoring both Rudyard Kipling’s 1897 novel, Captains Courageous: A Story of the Grand Banks and Gloucester’s cultural heritage. Kipling’s novel features Harvey Cheyne Jr., the selfish wealthy boy who was swept overboard and spared by Gloucester fishermen. As a visitor of Gloucester, Kipling captured details of the area that brought his novel to life. Captains Courageous illustrates Kipling’s perception of Gloucester fishermen and of the Grand Banks as the backdrop of Harvey’s revival from a selfish boy to a mature young man. Kipling’s time in Gloucester will also be celebrated in a number of activities, including a discussion hosted by local author David McAveeney, who will examine Kipling’s writings using his book as a reference: Kipling in Gloucester: The Writing of Captains Courageous. His talk is scheduled for March 4, from 7 to 8 p.m. at the Bookstore of Gloucester on 61 Main Street. On the day of the festival, Captains Courageous will be divided into four sections and read aloud at four different places throughout Gloucester: 9 a.m. to 11 a.m. at the Cape Ann Historical Museum, 11 a.m. to 12:45 p.m. at the Sawyer Free Library, 1:45 p.m. to 4 p.m. at the Gloucester Maritime Heritage Center, and 4:15 p.m. to 6 p.m. at Cape Ann Art Haven. If being read to is not enough, “Three Sheets to the Wind,” a group of sea shanty singers and musicians, will serenade the crowd from 7 to 7:30 p.m., followed by a playing of the 1937 Captains Courageous film from 7:30 to 9:30 p.m., starring Spencer Tracy, Freddie Bartholomew and Lionel Barrymore. A scavenger hunt, rope making, paper-dory decorating, and other activities will also accompany the day’s events, along with the opportunity to discover the Gloucester community. Robinson said that people of all ages are expected to attend from Gloucester including Mayor Carolyn Kirk and from across the North Shore as well as the greater Boston area. Robinson says the Captains Courageous Festival highlights many of Gloucester’s treasures in a creative way. 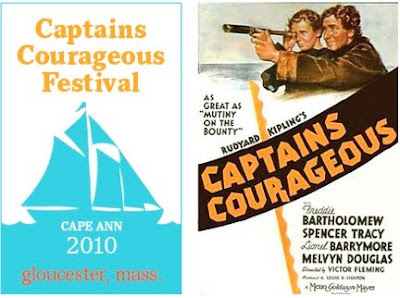 Captains Courageous Festival is presented by the Society for the Encouragement of the Arts (seARTS) in partnership with Cape Ann Art Haven, Cape Ann Community Cinema, Cape Ann Historical Museum, Gloucester Maritime Heritage Center, Sawyer Free Library and Schooner Adventure. The Festival will take place on Saturday, March 6 from 9 am to 9:30 pm. To get a copy of Kipling’s Captains Courageous before the Festival, visit the Sawyer Free Library, Gloucester Bookstore or the Dogtown Book Shop, or visit Rockport’s Library or Toad Hall Bookstore. To buy the Captains Courageous movie tickets, visit their web site. Essay composing may even be a wise knowledgeable job presently daily. that's why we've a bent to tend to those days extending a enterprise with this. in a position to} ready to asking price exclusive essay however if you wish higher to urge paper writing services here EssayPanda.org bbb, we've a bent to tend to are literally able to assist you this service. Shop of Ray Ban sunglasses, UK Replica Ray Bans on sale for men and women, Ray Ban outlet on huge discount. I was very amused when i saw the title 'A Story of the Grand Banks' since i have been looking for this for a long time. This is a very nice and interesting post, and finding information on courageous captain story is amazing. Whenever you need Help with Analyzing Thesis Data Quantitatively Using SPSS, follow this link and get to be fully assisted. I am greatly honored to have come across a post on the Story of the Grand Banks, something that may not be near what I was looking for but very exciting and impressive. I do hope that you will share more. If what you are looking for is Business Plan Writing Help, we are people to team up with. We are a team of professional writers, experts that deliver only the best. We have never given clients a reason to be doubtful of the professionalism of our services. The blog or and best that is amazingly valuable to keep I can share the thoughts without bounds as this is truly what I was searching for, I am exceptionally agreeable and satisfied to come here. Much thanks. I really would like to see more of your posts,I will be following your blog and even subscribe to this blog. Amongst our professional academic writing services include help in writing research paper to scholars like you .Don't hesitate to make an order with us today. We are the best you can ever have.